Perhaps the most catastrophic failures that we’ve witnessed in our 25+ years in the home inspection business has been fully-inward-bulged (collapsed) basement foundation walls. Each failed wall (made entirely of hollow core concrete block) literally exploded into the basement followed by a river of mud or earthen landslide. If anyone had been sitting or standing near the wall at the time of failure, I doubt they would have survived. Fortunately, we’ve never heard of a serious injury or lost life, but we have witnessed the emotional grief/anguish that ensues once the homeowner finds out that their homeowner’s insurance policy will not cover the cost of cleanup or repair. Obviously, these costs can easily exceed tens of thousands of dollars. A typical basement foundation in North Alabama seems to consist of a poured-in-place concrete footing supporting a hollow-core, concrete block wall. Usually, the basement floor slab is placed on top of a bed of gravel (called a floating slab) and this slab directly abuts the lower edge of the basement foundation wall. This floor slab is actually critical to the long term performance of the basement foundation because it provides crucial lateral support along the bottom of the wall. A pressure-treated, wood sill plate (called a mud-sill) is then bolted to the top of the basement wall and the home’s overlying wood-frame floor system is usually secured to this sill plate. This wood frame floor system is also crucial to the long term performance of the basement wall because it too provides important lateral restraint along the top of the wall. Hence, basement walls are laterally supported along their top and bottom edges. Whenever backfill soil is placed against a basement wall, it exerts lateral pressure against the wall. This external lateral pressure tries to bend (bow) the basement wall inward-between the top and bottom supports (restraints). Whenever the lateral pressure is so great that the basement wall begins to bulge inward, a long horizontal crack will form-especially if the basement wall is made of hollow concrete block. Again, this seems to be the construction material of choice in North Alabama; we seldom see solid-poured concrete walls. 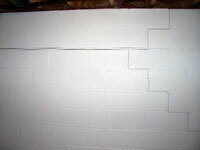 Once this horizontal crack forms, the basement wall has lost all appreciable lateral resistance, so the wall is extremely vulnerable to an inward bulging failure at anytime. Hence, the tell-tale clue of a serious basement wall problem is a long horizontal crack near the mid-height of the wall. This crack will typically transition into both ascending and descending stair-step cracks near the ends of the wall-i.e. near the basement corners because the adjacent side walls act like buttresses and prevent inward bulging deformation. The amount of lateral pressure exerted by “backfill” is based on the type of backfill material. Heavy clays and silty clay soils tend to exert large lateral pressures, whereas clean sands and gravels exert fairly small lateral pressures. The basement’s worst enemy, however, is usually not the soil backfill material but water. If water ever builds-up in the soil backfill, it exerts “hydrostatic pressure” against the basement-just like the pressure that water exerts on a lake’s dam. Hydrostatic pressure is usually two or three times greater than the lateral pressure exerted by backfill. Hence, an important construction feature of any basement is to have an adequate exterior drainage system-usually called a footing drain. Moreover, the ground surface around the home should be graded so that it slopes away from the home, and the roof should be complemented by well-maintained and fully functional gutters. These features are necessary to ensure that large amounts of water never reach the backfill zone around a below grade basement. Another problem with silty clay or clay soil backfill materials is that they tend to impede the flow of surface water down to a footing drain, because they are generally impermeable and they tend to absorb and hold water. Sands and gravels, on the other hand, allow surface water to flow freely down to a footing drain. Hence, the backfill material of choice is sand or gravel. Unfortunately, most builders backfill the basement with the original soil that was excavated-and in North Alabama this is generally silty clay or clay. If there is no footing drain surrounding the basement and/or the drain does not gravity flow to daylight (into the air somewhere down grade), then hydrostatic pressures will likely build-up outside the basement and failure will likely occur at some time. The International Building Code provides important structural information regarding residential basement wall construction. What you’ll find when reviewing this table of information is that the common, 8-inch wide, hollow core, concrete block basement wall just isn’t suitable for below grade basement wall construction-at least for backfill heights exceeding four feet. Most below grade basement walls support backfills of seven or more feet. The Code would require that these basements be constructed of reinforced concrete block. Fortunately, there is hope for some bulged basement walls. Three common repair techniques include bracing the wall along the inner face with closely-spaced steel frames or steel posts; inserting vertical rebar into the hollow cells and placing concrete into these hollow cells; or adhering carbon fiber straps to the walls using structural epoxy. These repairs give the wall increased strength to resist lateral bending forces. Each of these repairs should generally be complemented by certain exterior drainage improvements. In some cases this may entail completely excavating the backfill material placed outside the basement in order to reduce lateral pressure on the wall and/or to replace an existing clay soil backfill with sand or gravel. This also affords one the opportunity to install a proper foundation drainage and basement water-proofing system. 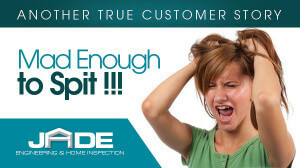 Hence the cost of repair may lead to the creation of more habitable space within the home-especially if the basement was formerly an out-of-sight-out-of-mind, damp, musty dungeon.